One of the most common questions we get at the tagging demos is, "I was told that if I touched a butterfly's wings, it would die. 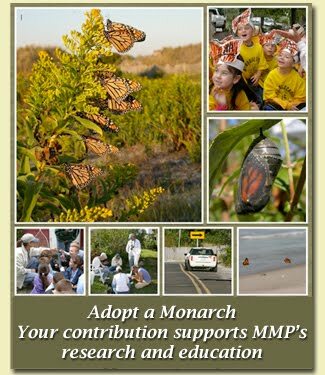 Aren't you damaging the Monarch by touching its wings?" Quite confidently, we respond, "No! Butterflies do need to be handled gently but they aren't hurt by being held or by the tagging process." Butterflies, moths, and skipper are all grouped together into the order Lepidoptera, from the Latin for "scaly wing," due to the shared presence of scales on their wings. Scales are also present on the head, thorax, and abdomen of these insects, as well as on their antennae and legs. Monarchs are quite resilient butterflies and it will take some scratching to remove scales from the wing. However, some butterflies do shed scales more readily than Monarchs do. Butterfly scales are actually designed to slide off the wing membrane quite easily, making the butterfly slippery and reducing its chances of being pinched in a bird's beak or stuck in a sticky spider web. The butterfly can shed some scales and escape without damaging the more important wing membrane underneath. Scales also provide Monarchs with their vivid colors, help them glide more efficiently, and keep them warm. The dark "fur" you can see on the upper side of the Monarch's abdomen is actually long, filamentous scales that help keep the butterfly warm by radiating heat close to the body! Some butterflies, including the Monarch, possess specialized scales that release hormones. 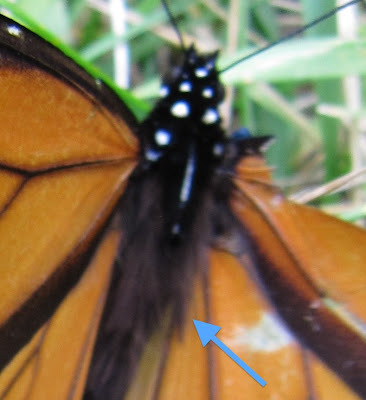 You can find some of these scales on the hind wings of male Monarchs: they look like raised, oblong dots and are called the androconial patches.